From a mission church in the wilderness of the Wisconsin Territory, to a landmark church in a bustling city, Sacred Heart/St. Patrick Parish in Eau Claire has a history of determination and faith, which can be traced back more than 160 years. To preserve the heritage and history, renovations at St. Patrick Church were recently completed to carry on the faith for generations to come. 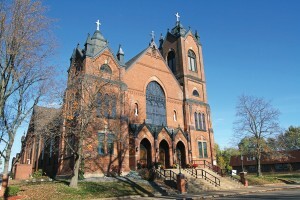 The first Catholic church in Eau Claire was built in 1858 as a continuation of St. Peter’s Mission, which began in 1853. 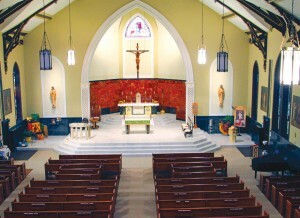 It became a parish in 1858 and was renamed St. Patrick. 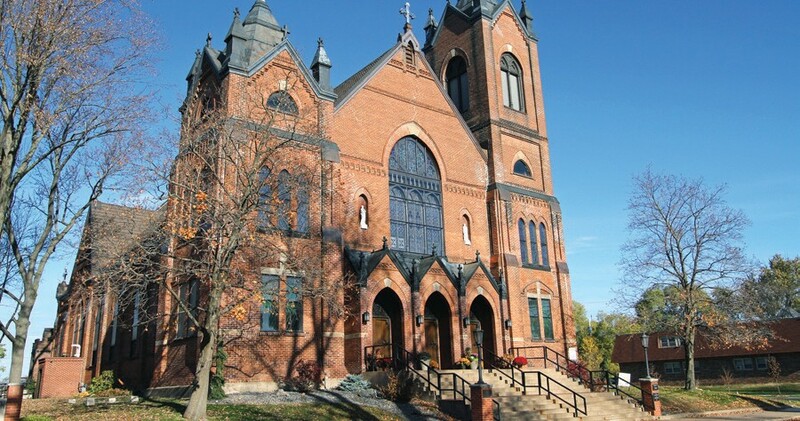 The 1800’s was a time of quick expansion for many pioneers and the population growth made St. Patrick Church susceptible to demographic changes. In 1875, cultural differences between German and Irish parish members at St. Patrick divided the parish. 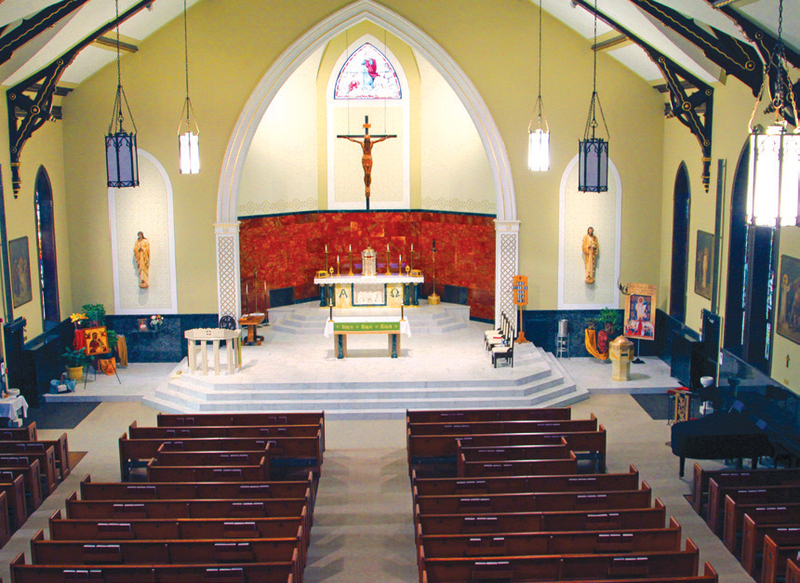 Sacred Heart of Jesus Parish was established at the request of 60 German families, in part so they could hear homilies in their own language. This marked a separation of the parish until the reunification in 1999. Even with a second Catholic church in the city, St. Patrick Church outgrew the original mission church built in 1858. 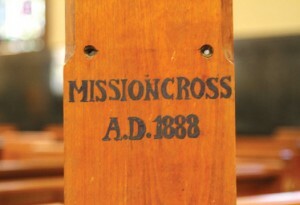 A new church and parochial school were dedicated in 1882. However, only two years later, the new church was destroyed by fire. 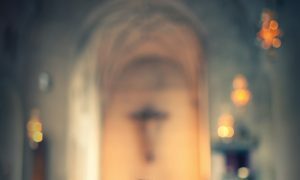 An example of faith was exhibited that day as a young boy, James Campbell, rescued the Blessed Sacrament. Campbell would later become St. Patrick Church’s first priest-son. In June 1885, the first cornerstone of the new St. Patrick Church was laid. Built upon the ashes of the former church, this is the same church where the faithful worship today. After 130 years of enduring the elements, a major renovation was needed to preserve the aging landmark, which is listed in the National Register of Historical Places. Though maintenance and other improvements were done over the years, the church was in disrepair. Sections of the plaster ceiling had broken away and paint was peeling from the walls. Plans were put into place in 2014 for a two-phase renovation project. 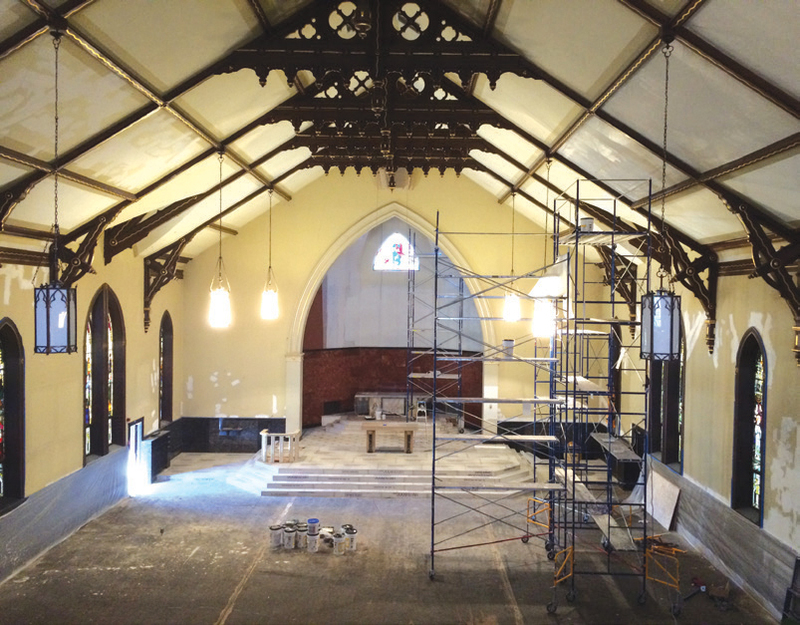 The first phase consisted of attic improvements, including new electrical, insulation and stained glass window repairs. The second phase included completely gutting and renovating the interior. Plastering, painting, carpeting, hardwood floor refurnishing along with handicap accessibility improvements were completed within the church. 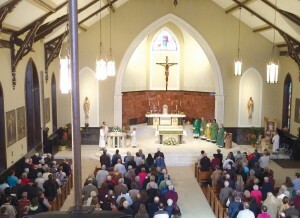 The church closed in April 2016 and six months later celebrated its reopening with a rededication Mass. St. Partrick Church was renovated from the top down, including cleaning and restoring the stained glass windows, removing the medal decor around the altar, ripping up and replacing the floors, repainting the ceiling and bringing in new pews. 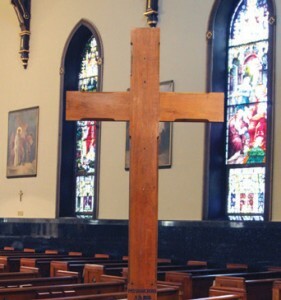 The church renovation didn’t just consist of fixing up the building. The community building exercise brought the parishioners and community together. People stepped in with their time and talents to make things happen. 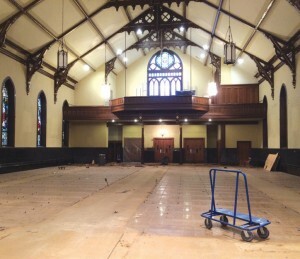 With the interior renovation, the church was completely stripped. Anything that moved had to be removed and then reinstalled. Pews were refinished and put back into place once the hardwood flooring was refinished and new carpeting and tile installed. The funds were raised faster than they ever thought they would be. People came together not only with their contributions, but with their time and efforts. Within less than one year, they achieved their goal of raising the $720,000 needed. The choir loft received major upgrades. The large stained glass window was removed, releaded and cleaned. This brightened up the area allowing the outside light to pour into the loft. 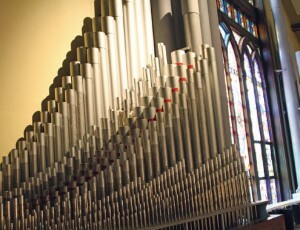 Many of the pipes for the organ were previously contained in the swell box. The largest of the pipes were bulging due to an inferior blend of zinc used by the manufacturer. Those pipes were rebuilt and more ranks of pipes were added. 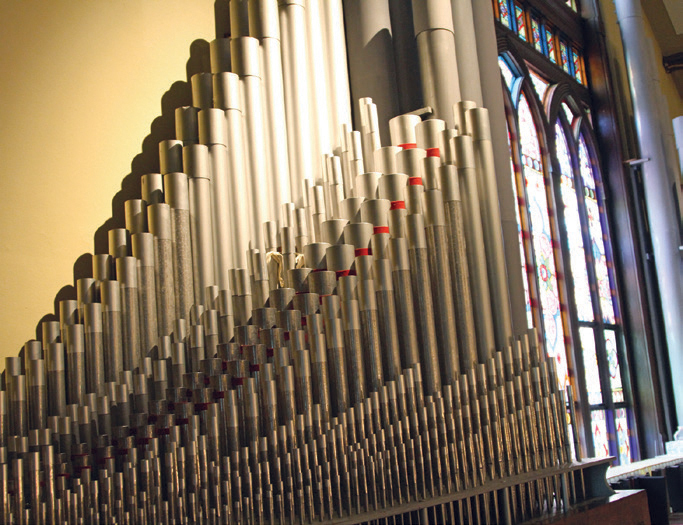 The massive organ pipes now cover an entire wall of the choir loft, with the stained glass window as its centerpiece. 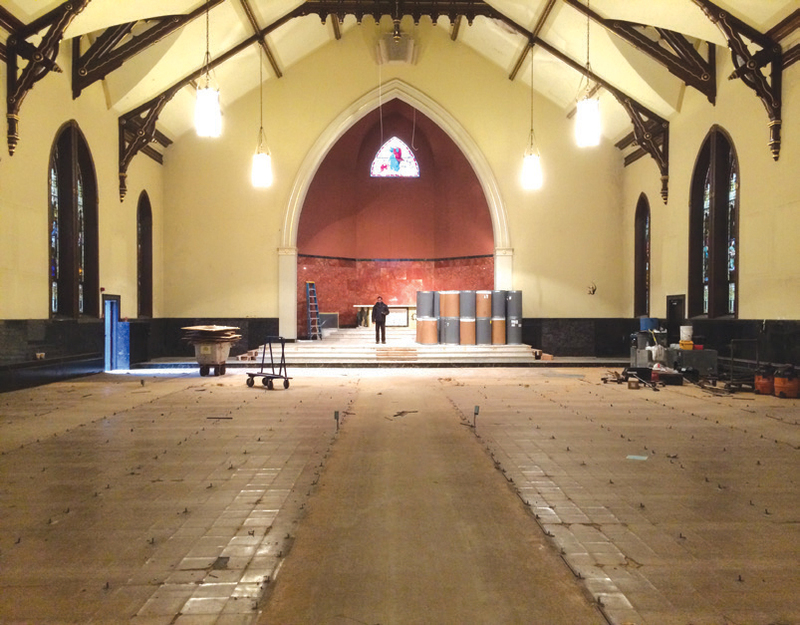 Throughout the 130-year history of St. Patrick Church, previous remodeling and improvements incorporated the long history of the church. The ambo is constructed from parts of the old Communion rail and the original mission cross from St. Peter’s is still used today. 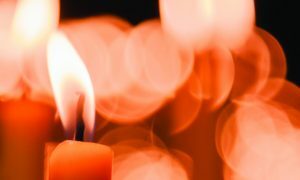 “I could really experience the generosity of the people and their love and commitment to the parish. It is a matter of pride for them – to fix it and keep it for generations to come. 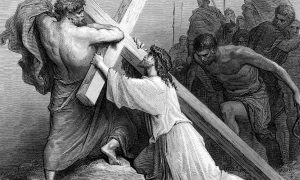 God blessed us.” – Father George Thayilkuzhithottu, MSFS, pastor of Sacred Heart /St. Patrick Parish.